Let’s pursue Example 2 from above. The data set used in this example is from Stata. Now let’s build up our model. We are going to use the variables child and camper to model the count in the part of negative binomial model and the variable persons in the logit part of the model. The Stata command is shown below. We treat variable camper as a categorical variable by putting a prefix "-i.-" in front of the variable name. This will make the post estimations easier. We have included the vuong option which provides a test of the zero-inflated model versus the standard negative binomial model along with the zip option which provides a likelihood ratio test of alpha=0 (basically zinb versus zip). The last value in the log is the final value of the log likelihood for the full model and is repeated below. Next comes the header information. On the right-hand side the number of observations used (316) is given along with the likelihood ratio chi-squared. This compares the full model to a model without count predictors, giving a difference of two degrees of freedom. This is followed by the p-value for the chi-square. The model, as a whole, is statistically significant. Below the header, you will find the negative binomial regression coefficients for each of the variables along with standard errors, z-scores, p-values and 95% confidence intervals for the coefficients. Following these are logit coefficients for predicting excess zeros along with their standard errors, z-scores, p-values and confidence intervals. Additionally, there will be an estimate of the natural log of the over dispersion coefficient, alpha, along with the untransformed value. If the alpha coefficient is zero then the model is better estimated using an Poisson regression model. Below the various coefficients you will find the results of the zip and vuong options. The zip option tests the zero-inflated negative binomial model versus the zero-inflated poisson model. A significant likelihood ratio test for alpha=0 indicates that the zinb model is preferred to the zip model. The Vuong test compares the zero-inflated model negative binomial with an ordinary negative binomial regression model. A significant z-test indicates that the zero-inflated model is preferred. The log odds of being an excessive zero would decrease by 1.67 for every additional person in the group. In other words, the more people in the group the less likely that the zero would be due to not gone fishing. Put it plainly, the larger the group the person was in, the more likely that the person went fishing. We can see at the bottom of our model that the likelihood ratio test that alpha = 0 is significantly different from zero. This suggests that our data is overdispersed and that a zero-inflated negative binomial model is more appropriate than a zero-inflated Poisson model. The Vuong test suggests that the zero-inflated negative binomial model is a significant improvement over a standard negative binomial model. Now, just to be on the safe side, let’s rerun the zinb command with the robust option in order to obtain robust standard errors for the Poisson regression coefficients. We cannot include the vuong option when using robust standard errors. Using the robust option has resulted in some change in the model chi-square, which is now a Wald chi-square. This statistic is based on log pseudo-likelihoods instead of log-likelihoods. The model is still statistically significant. The robust standard errors attempt to adjust for heterogeneity in the model. Now, let’s try to understand the model better by using some of the post estimation commands. First off, we use the predict command with the pr option to get the predicted probability of being "an excessive zero" due to not gone fishing. 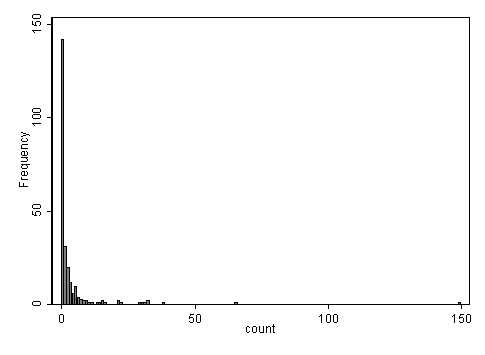 We then look the distribution of the predicted probability by the number of persons in the group. We can see that the larger the group, the smaller the probability, meaning the more likely that the person went fishing. 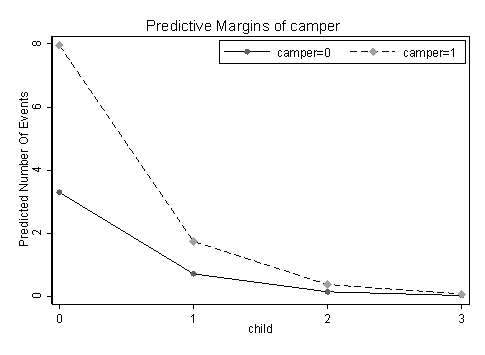 Finally, we will use the margins command to get the predicted number of fish caught, comparing campers with non-campers given different number of children and maringsplot to visualize the information produced by the margins command. Notice that by default the margins command fixed the expected predicted probability of being an excessive zero at its mean. For instance, here is an alternative way for producing the same predicted count given camper = 0 /1 and child = 0.
zip — zero-inflated poisson regression.